I won a cookbook giveaway! Since Mr. Kitchen and I have started planning our wedding, I’ve become a devoted wedding blog reader. I recently entered a giveaway hosted by OneWed for the Dam Good Sweet Cookbook by Beard nominee David Guas, and I won! The cookbook features New Orleans-style desserts and I can’t wait to give it a try. (How I’m going to fit into a wedding dress, I have no idea.) Mr. Kitchen is in for a yummy fall! Speaking of yummy, Mr. Kitchen and I have been working tons and tons over the past few weeks, and we are plum tired. So tired, that I forgot to buy tickets for today’s Vendy Awards. So instead of spending the afternoon tasting the delicious fare of some of the city’s best food trucks, we’re heading over to Eataly. Something tells me my bank account is going to be very angry with me later… Hey, some girls shop for shoes — I shop for food! Anyway, on to fall produce! Next up: Carrots. 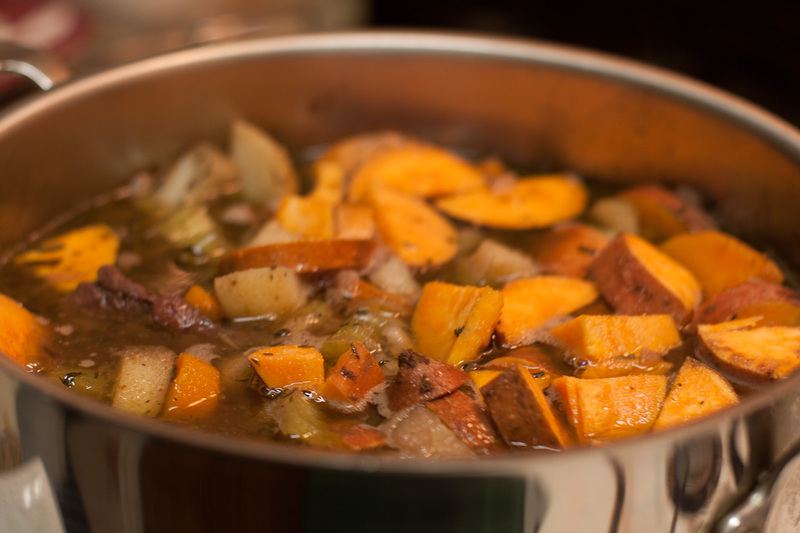 Definitely one of the most versatile of the fall vegetables, carrots can go in, well almost any dish, and one of the easiest fall dishes to prepare is a hearty, stick to your ribs beef stew. Seriously all you need is the ability to chop, brown and boil to make stew. I’ve used lots of different cuts of beef for stews but I recently tried giving short ribs a try. I really liked the way it turned out — the marbled meat was definitely falling off the bone by the time the stew was done and it was absolutely tender. I’m also a firm believer (and perhaps this is my Irish heritage talking), that you can put in almost any vegetables you’ve got lying around. In a bowl, toss the short ribs with flour, salt and pepper. In a large pot, heat oil and brown the short ribs on all sides. 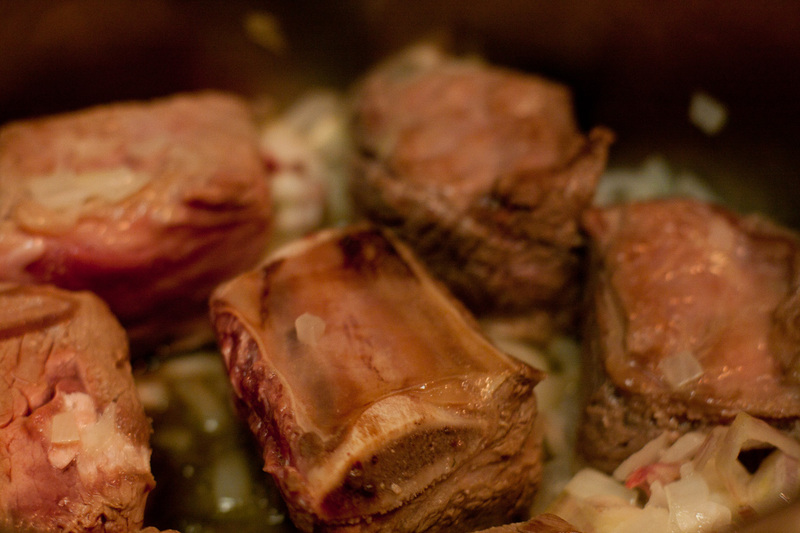 Remove short ribs from pot. In the remaining oil, saute shallots. Once they are soft, add the meat back in and add the wine. Cook over medium heat until the wine is halfway reduced, about 10 minutes. 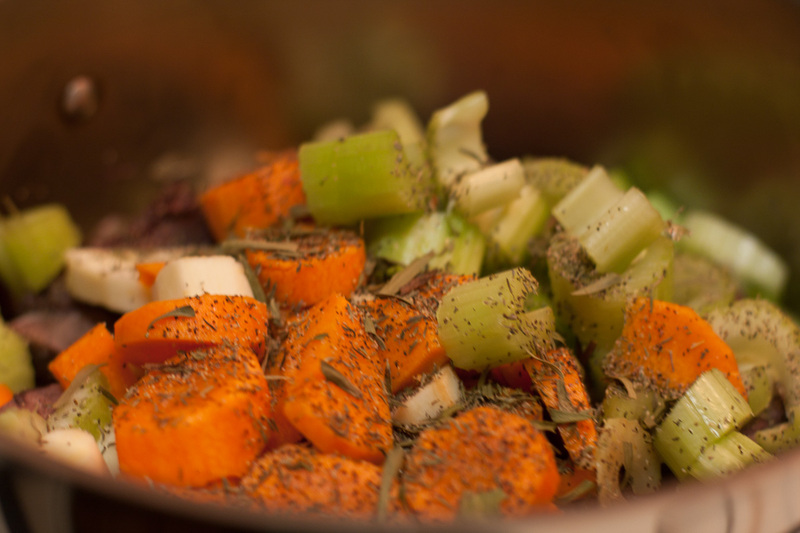 Add beef stock, thyme, tarragon, carrots, turnips and celery and reduce heat, cooking meat until it is very tender (about 1.5 hours). Add chopped potatoes and cook for an additional 45 minutes to an hour, until all vegetables and meat are completely tender. Season with additional salt and pepper as desired. Big Girl Kitchen · Graduating from one square foot of counter-space.